Original post can be found on the Credex website here. Credex hosted its launch event on Tuesday 9th of April at the NatWest Accelerator in Brindley Place, Birmingham. It was well attended by stakeholders from across the West Midlands who were interested in how Credex could help small businesses. Tim from Co-op & Community Finance Reflects on Future Co-ops, two weeks on ! So, how do we make Co-op Deserts Bloom? 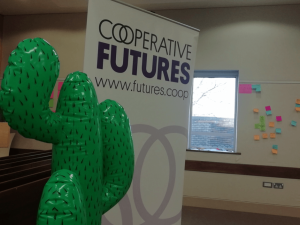 That was the topic and challenge presented to us at the 2019 Future Co-ops conference we sponsored this year. As Coop News had already reported, the conference this year was designed to be one of ‘active participation’ led by Think Digital, a department of the Central England Co-op retail society, rather than your conventional sit and listen format. The two day event took us on a journey of discovery, storytelling, conundrums, outcomes and pledges; oh and a quiz based on an old hardware store brochure, thrown in for good measure. So, what are my take away thoughts and reflections, two weeks on? Original post from the Power to Change blog – published here.